What will the Giants do? All of the WR’s are vertically challenged! The New York Giants do not have a lack of speed and big play potential when you look at their Wide Receiving core, regardless of what some morons think and write. With the speed and explosiveness of Mario Manningham and Sinorice Moss, and Ron Hixon you would have to be crazy to think that. The Giants may have some of the fastest receivers in the NFL, in truth. The only big problem for this team is the glaring shortness of these Wideouts! 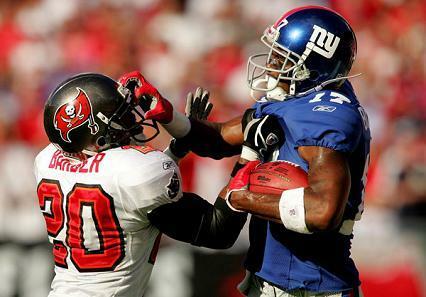 Without Plaxico the tallest of Eli’s targets is Hixon at a generous 6′1. And that is the one thing they had been missing all last season and still now. They need a tall athletic target to go get jump balls in crowded spaces, which was Plaxico’s specialty. Before Burress they always had the WR skilled TE, named Shockey! What the Giants need is a WR who is over 6′1 who can make some big catches in some big spots. If he can get up and catch the ball in certain situations the Giants will only need to secure a role playing wideout, in the draft. Now, there are 3 options for this team, as far as I see it. 2. They could trade up picks in the draft to secure Crabtree or Maclin, which is what all of New York is hoping for. Personally I am not convinced, that would be the right move, but hey I’ve been wrong before. 3. They could also decide to just go for broke and trade a good helping of players and picks over several years for Boldin or Braylon Edwards. The Giants need receivers and without a doubt Jerry Reese has his eye on these two. So much so that someone had released the story specualting Reeses’s interest to the media about Edwards, who plays a very similar game to Plaxico and seems to have less of the character flaws. 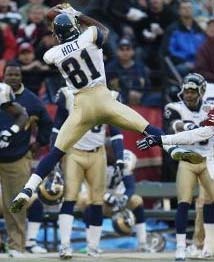 Torry Holt, is a getting a litter bit older and has had some extensive knee surgeries and problems, yet if the Giants can sign him for a short deal they can bring up their draft pick wideout the proper way letting him mature under the tutelage of a true leader, which is what Tory Holt is. The Young Giants recievers could use the Veteran leadership this signing would bring, considering they have lost Amani Toomer. Matt Jones is 6′6 and is a super jumper and a great athlete, yet his off field issues make him a cheap buy in free agency. The Giants are notorious for taking a chance, and over the past couple of years Matt Jones has had very sub par seasons. Make no doubt about it this guy is a risk, but it could pay off if you sign low and he plays high, and I don’t mean on cocaine! This 6′4 physical monster can put any DB out of a position when he gets rolling. He also has had some issues over the past couple of years, and had seemed to play his way out of the 1 spot in Jacksonville. The Jaguars have however counted on Reggie for big plays and countless jump balls and his stats show it. In 2007, Reggie put up 10 TDs in only 6 starts, while only catching 35 passes for the season. He has brake away speed and he is very young and looking for a fresh start. He has low value because he just didn’t mesh well with the Jacksonville coaches and management! Is a wide out known for his jumping ability, he was supposed to be the replacement for Johnson in Carolina, but it just didn’t work out. He has made some great plays over his career and still is relatively young. Yet the game may have passed this guy over. He is my least favorite possible free agent as I see it now. Miles Austin has had some pretty strong showings over his short career. He had played along side TO and Roy Williams in Dallas. Miles Austin, last year would sometimes seem to out play both Owens and Williams. 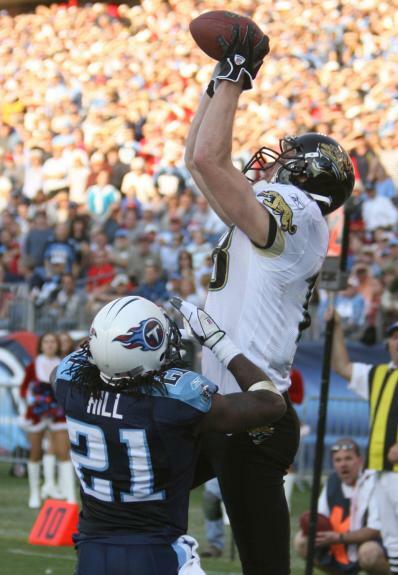 At 6′3 this player has the potential to be a big catch WR, who could really help replace the loss of Toomer and Burress. He has done great things in Dallas and it’s funny to think they just cut him. His knee issues must be pretty severe for Dallas to have dropped him, but if he checks out good with the doctors, I am all for this guy! I want to cry when I think about how many times this big guy has saved me from losing money. No matter what I will always bet on this guy. Joey is coming into his final seasons as a pro and I can’t think of any other wide receiver who has made as many HUGE catches as this guy without producing any real gawky stats. My friends and I have a saying, “Joey Jurevicius, the man-child from Penn State will always give you 1 big play every game for the rest of his life. Even though he might only record one catch, in the end it is going to matter”. I think the Giants would be nuts not to want him, Joey brings an positive and inspirational aura and an attitude wherever he goes. Jurevicius is a motivational figure that the Gmen may need in that Offensive huddle this season. I know he isn’t fast anymore, but he has height and great hands, and a history with the New York Giants, which could make him an easier sign! No matter what, I cant wait to see big blue fix the issues with this WR core. I think Jerry Reese has some an up his sleeve, so lets see what cards he decides to play on draft day!